STEP seeks to protect the most vulnerable children in ways that become locally sustainable. Our long term goal is to work towards better child protection systems in Iraq. To do this we work directly with professionals to strengthen key services for children. We also work directly with children to empower them, to understand their rights and how to secure them. Find out more about STEP and how you can help us to reach our goals by getting involved! Since the referendum vote in the Kurdish Region of Iraq there have been a number of sanctions imposed, and displacement of more people from their homes. Leaders are stating that they wish to resolve the situation through talks and we are hopeful these will succeed. Despite this, STEP projects continue to run and are supporting the most vulnerable children in the region like Nadia. Nadia Ali Mahmud (not her real name) is 15 years old. When a rocket hit her home in Iraq Nadia was only very young and she lost her hearing . Due to her deafness she has never been able to attend school, but through attending a STEP Child Friendly Space she can now write her name and has found a love of drawing. She met one of our staff with her father to talk about her story, how STEP has helped her and to share her art work. Nadia's family fled increased fighting in their home town and travelled over 250 miles into the Kurdish Region of Iraq in search of safety. Nadia now lives in a tent with 22 other family members in a displaced persons camp about 45mins drive outside the city. The camp is surrounded by mountains that are bare and dry in the summer and snow covered in the winter. She was very happy for STEP to visit her tent to show us her paintings. Although she had never attended school, through the STEP Child Friendly Space she has been able to learn how to write letters and can now write her name in English as well as Arabic. Nadia is one of over 10,000 children STEP are supporting. Thank you to all those who have given financially to STEP or volunteered your time. As Christmas approaches please consider other ways you may be able to support our work like Give as you Live! STEP has coordinated with another NGO working with children in Mosul and has sent 1,000 trauma teddies for distribution. Another 50 have gone to the children's cancer hospital in the city and 8 more boxes were shipped from the UK this month. Thank you to all who are involved in supporting STEP to provide this support. The UNICEF Regional Director for the Middle East in a press statement this month said, "The worst of the violence in Mosul may be over but for too many children in Mosul and the region, extreme suffering continues. As with any other child in the world, they have the right to be safeguarded, including through legal documentation. Children are children!" As the displacement crisis of the last 5 years in Northern Iraq slows the need for longer term child protection and support strategies remain. The Iraq government have passed an new national child protection policy that is another step forward towards creating a society that protects, promotes and enhances the lives of children. The policy, supported by UNICEF will be implemented over the next 10 years. As STEP has worked closely with both UNICEF and government we have also been invited to be involved in discussions around this new policy. 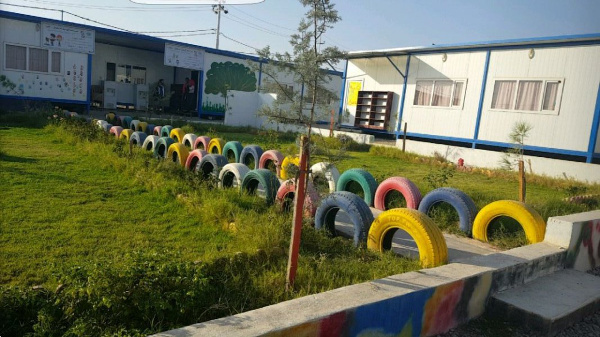 It lays the groundwork for the government of Iraq to create an environment that will protect the children of Iraq who are at risk and to support programs that will prevent and respond to violence, abuse and neglect. The new library within the STEP Child Friendly Space at the Refugee camp in our governorate has been wonderfully received by the children and the community. There are a variety of Arabic books, including stories and novels, encyclopedias, art books, history books and a few English books! Funding has been secured for the STEP Child Protection work in this camp to continue over the next year as the team focus on training and mentoring key staff and the community for this project to be handed over fully as community run structure by the end of 2018. As the displacement situation in Northern Iraq stabilises it is still critical STEP are able to continue work that supports the strategic child protection, core training and mentorship work, the government and local NGO\'s are not yet able to provide. Although there are many positive things occurring we are in desperate need of funds to cover the core costs of our work. If you are able to fundraise in any way or have professional skills to support STEP to raise the money we need we would like to hear from you. Marketing, Fundraising, and Social Media Platforms are all areas in which we are looking for technical support. Over the last 8 years STEP has been working with the Kurdish authorities on the necessary laws, processes, paperwork and training to be able to implement a sustainable approach to caring for children without a family. A huge milestone in this collaborative project was reached when earlier this month the first child was placed with a foster family. In Kurdistan hundreds of children live in social care homes. Although these children are provided with food, shelter and education they do not get the love and affection every child needs to flourish. In 1989 the world agreed that no child should be without a family and the UN convention on the rights of the child stated: A child, for the full and harmonious development of his or her personality, should grow up in a family environment, in an atmosphere of happiness, love and understanding. On the 11th March 2015 STEP signed a memorandum of understanding with the Kurdish government of Sulaymaniyah to be able to pilot a foster care project in the region. Five staff from the Department of Social Services were appointed to work on the project; and intensive training of these staff commenced at the end of 2015 facilitated by our International Social Worker Consultant. A year later, at the end of 2016 the Foster Care department was officially opened which was another momentous occasion for all those involved. At the official opening of the department the Founder and Director of STEP said; \'this project will not remove the need for the care home completely, but we hope that many more children will be able to experience life in a caring family because of this project. We know that children hold a special place in the hearts of the Kurdish people, we will protect their identities and the identities of the children placed with them so that the children, for the first time can experience a normal childhood.\', A government official also spoke to thank both STEP and UNICEF for their \' continual support\' and explained how foster care is part of a wider project on how to give \'love and affection to children\'. With your help and support STEP is able to continue to facilitate this work and plans to have the second child placed by the end of April. There are already 4 families who have been approved, undergoing a rigorous selection and vetting process and are now waiting to receive a child in need. Athough the displacement from Mosul has not been as large as initially expected, the battle for control of the city continues and STEP are still on standby with UNHCR to help support with child protection assessments when necessary. Since 2004 violent conflict in Iraq has displaced 3.3 million people in addition to more than 200,000 displaced Syrian refugees; who have fled their homes and sought refuge inside Kurdistan. Within the Sulaymaniyah governorate there are now 8 camps; but you may not be aware that 75% of refugees and 88% of internally displaced people (IDPs) live in either rural or urban areas. STEP is working to support these families through our Mobile Protection and Distribution Teams. Mr Fazel and his family are Yazidi beneficiaries of STEP food distribution. They left their home in Mosul at the end of 2014 and fled to Kurdistan for safety. Mr Fazel says; 'the food is very good and it is sufficient for 20 days. People are very thankful for your organization'. The STEP Mobile and Distribution Teams both work to support vulnerable children and families that are living in non camp settings. They work across 49 different locations and last year supported over 1500 different families. They work in close partnership with each other, as well as various other charities to be sure aid is not duplicated. The teams identify and needs assess vulnerable children and families against set criteria. A total of 54% of internally displaced people and refugees are under 19 years of age. The Distribution Team deliver monthly food packages and during the winter months provide winterisation packages. These include warm clothes, blankets and sometimes carpet to help insulate from the cold. The Mobile Protection Team social workers identify and assess where child protection case management is necessary. They then manage this case load alongside providing a wide range of other psychosocial support activities to children through art, games, and music. In 13 areas they have set up community child support centers where youth committees have been created and parent awareness sessions are conducted as a child protection preventative measure. When appropriate, the social workers are also able to refer children and families to other agencies that can further meet the specific needs of the child or family. UNHCR are preparing to accept 710,000 displaced people into various areas outside Mosul and have identified certain areas in the Suliemany Governate to host some of these families. STEP are on standby to support with child protection assessments. The extent of trauma and suffering these families have endured will not be fully understood for some time. STEP is currently supporting 12,000 displaced, refugee and local children through various projects on Iraq. Many families have fled due to conflict and we are meeting needs of vulnerable children and their families both in and out of camps, for Internally Displaced People (IDP) and Refugees. In camps we support through our Child friendly Spaces (CFS) and Child Protection Units (CPU). For those in unofficial shelters across the region we identify and support through our Mobile Teams that bring a wide range of services to children and families in need. STEP is also working alongside the government to improve and strengthen the overall Child Protection System in Kurdistan. STEP's first project, a Child Friendly Space (CFS) in the heart of the Sulimany Bazar called the Drop In Center (DIC) opened its doors to working children on the 2nd January 2002. Since then it has seen a huge rise in the number and diversity of children due to the recent crisis in Syria and Iraq. Last year there were 27,975 visits to the DIC and 1,630 children who visited for the first time. Out of necessity it has become a place where children learn tolerance and acceptance of those who are different. Hassan is one of the many working children that visit the DIC each week. He had to leave his home of Salahadin in central Iraq due to the current conflicts and fighting and has now been attending the DIC for two years. Hassan works selling plastic bags, chewing gum and stickers in the Bazar, he doesn't currently attend school. Unfortunately this is a common story amongst many children living in the area. 'I have learnt how to respect the rules, not to carry weapons, save public property and not participate in the protests because it is not for children. I have made new friendships as well', says Hassan. The DIC moved to a bigger and better location last month. It is still in the centre of the Bazar where most of the children work or beg. This has allowed us to provide specific rooms and activities for girls as well as more targeted therapeutic and psychosocial activities for the children. 'Here in the new location we have a separate room for girls only, with special games for girls. Also I like the big space and it is clean'. Mariam, 12 year old Syrian refugee. On August 15th the Kurdish and Iraqi authorities opened their northern border with Syria. Since then over 50,000 Syrians crossed the border and became refugees inside Iraq. A temporary camp has been established, 30 minute drive outside the city. There are plans to build a more permanent refugee camp, which will have concrete bases for their tents and prefabricated buildings for a school and child friendly spaces. However, this will take time. Iraq is already home to some 150,000 refugees. In our location we had around 15,000 mainly in the city before the recent influx. Many are living four to five families to one rented house. A recent assessment indicated that 75% of their income was being used for rent. This means that financially many are in critical situations. It is estimated that by UN agencies that by the end of the year there could be 350,000 refugees in Iraqi Kurdistan. Half of the refugees are under 18 year old. STEP in partnership with UNICEF and the local Department of Social Affairs will be assisting refugee children by providing child and youth friendly spaces and the monitoring of child protection violations. There are many needs, children in particular will require warm clothes and strong shoes for the winter. Recreational materials and sport equipment will also be needed.